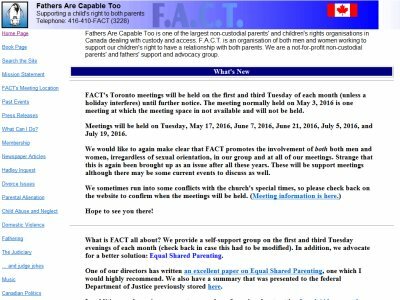 One of the largest non-custodial parents' and children's rights organizations in Canada dealing with custody and access. F.A.C.T. is an organization of both men and women working to support our children's right to have a relationship with both parents. They are a not-for-profit non-custodial parents' and fathers' support and advocacy group.